The Teacher Practice Networks (TPN) initiative supports a vast national network of teacher leaders who mentor and coach their peers. Teacher leaders’ classroom experience gives them practical firsthand insights and empathy for the challenges that teachers face. 95 percent of teachers coached by TPN teacher leaders reported increased self-confidence in their standards-aligned teaching. Located in the heart of the Bronx, Jonas Bronck Academy is a public middle school with about 270 students, taught by 25 educators. It may be a small school, but it stands tall in the realm of teacher-led professional learning. When he was first hired at Jonas Bronck, Richard Dirksen became a teacher leader, drawing on collaborative instincts and a trailblazing, supportive administration. “But teacher leadership really took off and became formalized under the Teacher Practice Networks [TPN] initiative,” says Dirksen. 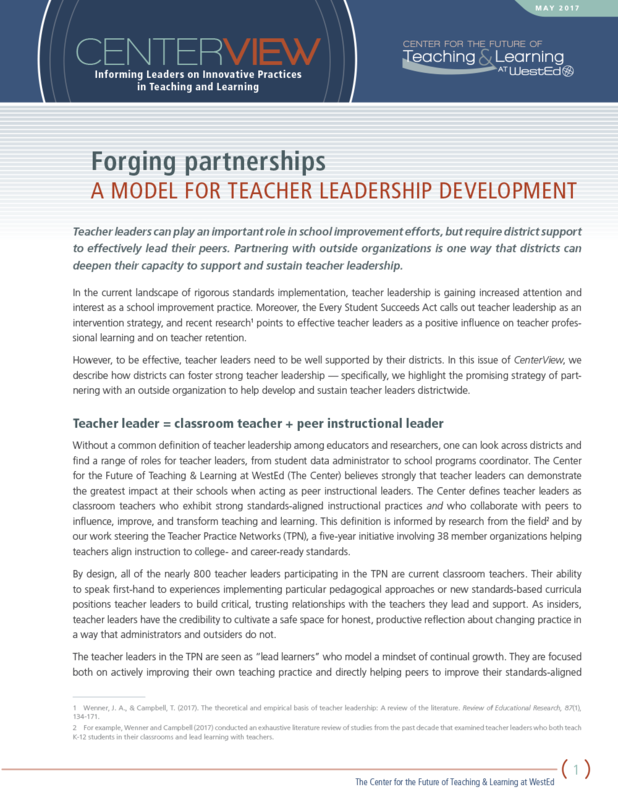 In 2013, The Center for the Future of Teaching & Learning at WestEd (The Center) collaborated with the Bill & Melinda Gates Foundation to launch the TPN initiative, which supports a vast national network of teacher leaders like Dirksen — expert teachers who mentor and coach their peers. By providing high-quality standards-aligned resources and ongoing professional learning led by teacher leaders, the initiative works to help teachers effectively navigate new ways of teaching as they implement the Common Core and other college- and career-readiness standards. 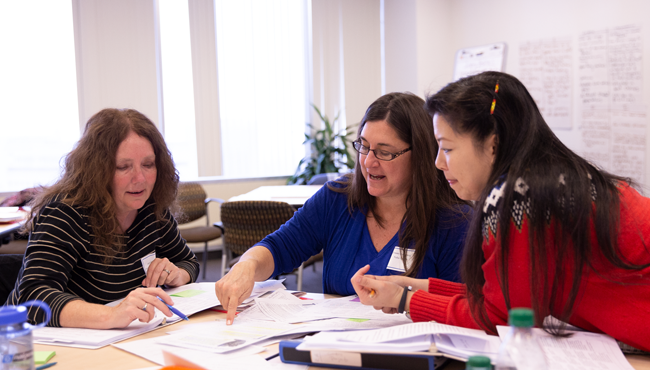 Through the TPN, the Gates Foundation has made grants to 38 different organizations that partner with local education agencies to train and directly support the work of over 800 teacher leaders across the country. In turn, these teacher leaders have provided direct professional learning to nearly 18,000 teachers in urban and rural districts, and have shared resources and materials with more than 1.6 million teachers online. WestEd acts as an intermediary in the TPN initiative — building and sharing knowledge across teacher networks, and gathering input and feedback on how the work is progressing. “This shared data has allowed us to gain quantifiable and descriptive evidence that teacher leaders have made a real difference for participating schools,” says Huebner. A five-year initiative with four cycles of grant making, the TPN is designed to address schools’ current needs, says Huebner, rather than replicate the same grant year after year. Support for standards-aligned instruction. The initiative first focused on identifying organizations, such as the National Council of Teachers of English and the National Council for the Social Studies, that were already working directly with teacher networks and could develop and curate materials aligned to the Common Core State Standards. 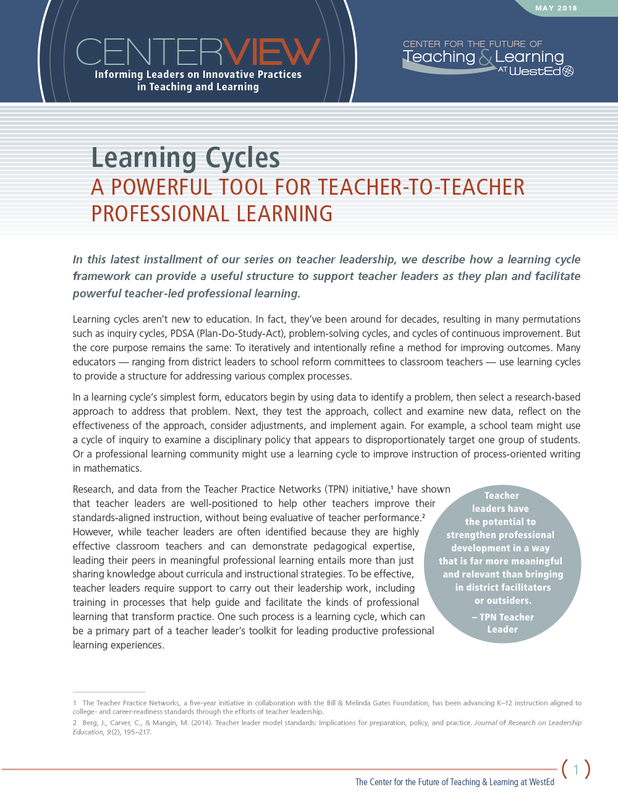 The TPN subsequently focused on developing a cadre of teacher leaders who were proficient in the standards and who could, in turn, help other teachers implement strategies better aligned to the new standards. Multiple models for training teacher leaders. 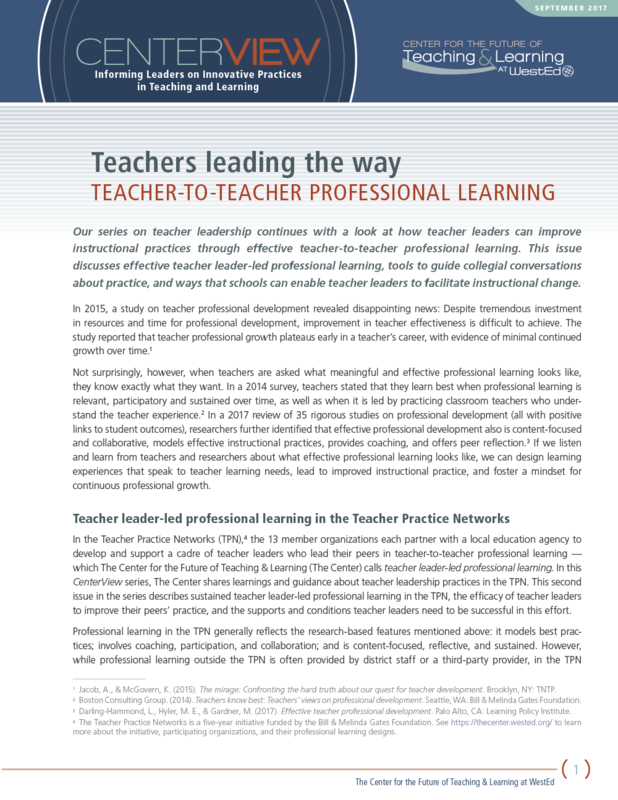 The organizations that work with teacher leaders through the TPN initiative address a variety of content and pedagogical practices to prepare them to lead teacher-to-teacher professional learning. “Some organizations’ models are curriculum-inspired, such as Facing History and Ourselves, while others are more pedagogically inspired,” says Huebner. Some, such as ReadWorks, offer a lighter touch, helping teacher leaders understand one instructional concept in teaching reading. “For new teacher leaders, this can be an easier place to start,” she says. Other models, such as Teach Plus, provide more frequent, intensive training on how to guide other teachers through cycles of learning. On every school campus, there are expert teachers with the capacity to provide effective instructional leadership and mentoring to their peers. Jonas Bronck Academy now chooses from a wide array of approaches to support teachers in their practice, says Dirksen, who teaches 8th grade English language arts. Dirksen led his department through a redesign of its curriculum to align it to the Common Core and to better scaffold reading and writing skills throughout the grade levels. “We didn’t have time to unpack all the standards, of course, but each of us dug deeply into a specific vocabulary standard because that was the instructional focus for our inquiry work that year,” he says. Aided by a TPN-member organization called Teaching Matters, Dirksen refined the process of peer intervisitation by introducing the Instructional Practice Guide (IPG) Coaching Tool, which provides a deeper lens for focusing on content and shifts in instructional practice. 91 percent felt more confident in effectively teaching in standards-aligned ways. 89 percent felt prepared to support or lead professional learning of other teachers. 99 percent valued sharing teaching ideas and materials integral to improving practice. 86 percent felt energized about being a teacher from their year as a teacher leader. Teachers who were taught by teacher leaders corroborated these findings, with 94 percent reporting an increase in collegiality, 96 percent indicating greater knowledge of high-quality instructional resources, and 95 percent expressing increased self-confidence in standards-aligned teaching. “The teacher leader model has worked brilliantly in some districts and hasn’t been as effective in others,” says Huebner. 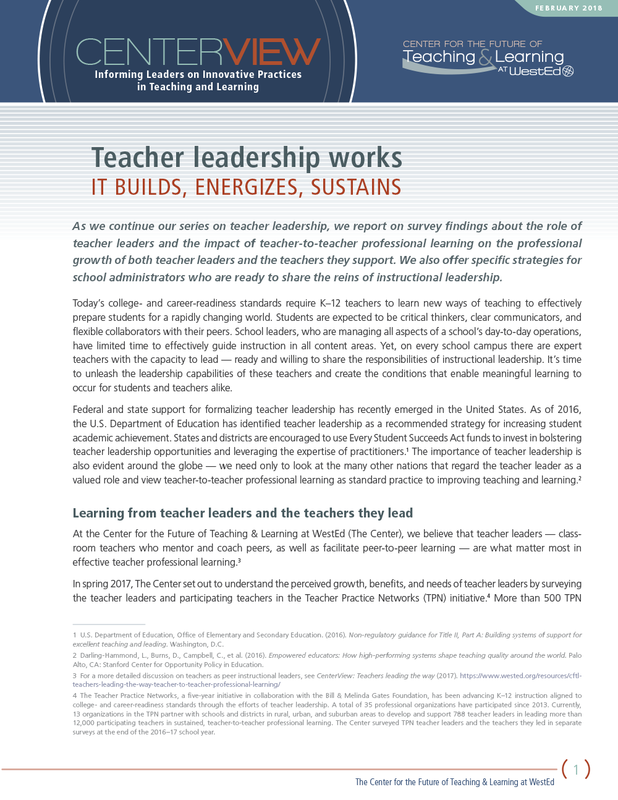 For starters, notes Huebner, to implement an effective teacher leadership model, it’s important to identify the right teachers to become teacher leaders — not necessarily seasoned teachers, but those with key leadership traits such as emotional intelligence, facilitation skills, the ability to positively influence peers, or experience in adult learning. Success is also dramatically enhanced not only when school and district leaders believe in a distributed leadership model, says Huebner, but also when they make time available for teacher leaders to do their work, give them the physical space to meet, and build teacher learning communities where they don’t already exist. Allow time. “Research shows that it takes at least 15 hours of professional development to help a teacher to change her practice to improve student learning,” says Huebner. That’s a strong argument for setting aside adequate time for teacher leaders to provide professional learning and mentoring to their peers. “On average, teacher leaders in New York City provided each teacher with whom they worked more than 27 hours of professional learning support during the course of the 2017–18 academic year,” says Huebner. Diversify support. At schools where teacher-led professional learning succeeds, says Huebner, teachers are getting intensive support. That support often materializes in a variety of ways, such as one-on-one or group meetings and classroom video intervisitations. Cultivate trust. Teachers are accustomed to top-down mandates, says Dirksen, but they are often concerned that these can be used against them in teacher ratings. What works better, he says, is for administrators to step back and allow teachers to create safe, collaborative, non-evaluative spaces in which the work can thrive. How can the teacher leader role be further nurtured and continue to influence school success? It needs to be built into a larger conversation about school change and not just be treated as an afterthought, says Huebner. The TPN initiative is supported by grants from the Bill & Melinda Gates Foundation.